Jimmy Heath has long been recognized as a brilliant instrumentalist and a magnificent composer and arranger. The middle brother of the legendary Heath Brothers (bassist Percy and drummer Tootie) and the father of Mtume, he has performed with nearly all the jazz greats of the last 50 years, from Howard McGhee, Dizzy Gillespie, and Miles Davis to Wynton Marsalis. Heath's career got off to an early start - in 1948 at the age of 21, he performed in the First International Jazz Festival in Paris with McGhee, sharing the stage with Coleman Hawkins, Slam Stewart, and Erroll Garner. One of his earliest big bands (1947-1948) in Philadelphia included John Coltrane, Benny Golson, Specs Wright, Cal Massey, Johnny Coles, Ray Bryant, and Nelson Boyd. Charlie Parker and Max Roach even sat in on one occasion. During his career, Heath has performed on more than 100 albums, including seven with the Heath Brothers and 12 as a leader. He has also written more than 125 compositions, many of which have become jazz standards and have been recorded by other artists, including Art Farmer, Cannonball Adderley, Clark Terry, Chet Baker, Miles Davis, James Moody, Milt Jackson, Ahmad Jamal, Ray Charles, Dizzy Gillespie, J.J. Johnson, and Dexter Gordon. Heath has also composed extended works - seven suites and two string quartets - and he premiered his first symphonic work, Three Ears, in 1988 at Queens College (CUNY) with Maurice Peress conducting. Renowned for his work as a Professor of Music at the Aaron Copland School of Music at Queens College, Heath maintains an extensive performance and teaching schedule and continues to conduct workshops and clinics throughout the United States, Europe, and Canada. He has also taught jazz studies at Jazzmobile, Housatonic College, City College of New York, and The New School for Social Research. In October 1997, two of his former students, trumpeters Darren Barrett and Diego Urcola, placed first and second in the Thelonious Monk Competition. For over 60 years, the legendary Heath Brothers have been synonymous with great jazz. Although Percy passed away in 2005, Jimmy and Tootie have pressed on, continuing to make great music. 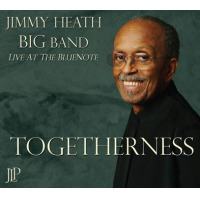 Jimmy's latest album with his big band, the aptly-named Turn Up the Heath, came out in 2006. This week at the Blue Note, he brings his big band back to the Blue Note to celebrate his 90th birthday.